Do you look at your entryway and think, “Something’s missing.” The answer you’re looking for could be a storm door. Storm doors enhance your entryway in many ways. They improve energy efficiency, curb appeal and protection. Although your entry door may be durable and can handle Milwaukee weather, a storm door still provides great benefits. As with anything, you can never be too safe. Installing a storm door on the outside of your entry door will help shield your beautiful entry door from rain, snow, hail and wind. It makes sense – adding another barrier to your entryway will increase your home’s energy efficiency. Storm doors from Feldco act as an added layer of insulation from the weather outside. 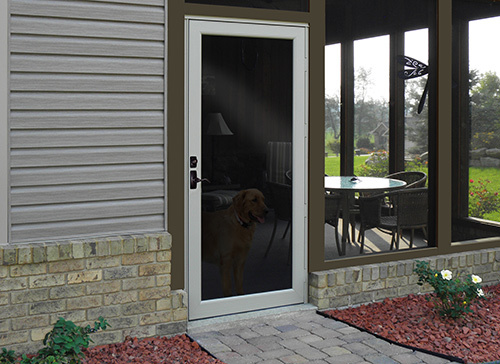 Our storm doors are made with high quality, durable aluminum that’ll stand tall during extreme weather conditions. It’ll act as another layer of insulation to help keep your home comfortable year round. During warmer months, you might want to open up your house and let some fresh air in. Having a storm door allows you to open the front door and let in fresh air and natural light. Increased natural light means you’ll rely less on artificial light to keep your home bright. Our storm doors can also feature full view or half view screens to help air flow in your home. Feldco offers Milwaukee homeowners with different styles of storm doors to help meet your specific needs and wants. Our retractable screen storm doors allow you to have a glass panel during cold months and a screen view during warmer months. The screen and glass sections easily swap for quick and simple transitions. Full glass storm doors from Feldco offer the best views to the outdoors and allow you to show off your entry door as well. Your home will benefit from increased natural light with a full glass storm door. Feldco’s metal mesh screen storm door features a strong and durable mesh screen that won’t rip or tear if animals or children poke at it. Storm doors with this screen are great for families with pets and children and help add a sense of protection for your home. Feldco knows that no two homes are the same. That’s why we offer many customization options for your storm door in Milwaukee. You can choose from colors, glass ans screen options and hardware to craft the perfect storm door for your home. It’s never a bad idea to install a storm door in front of your entry door because the weather in Milwaukee can change on a moment’s notice.